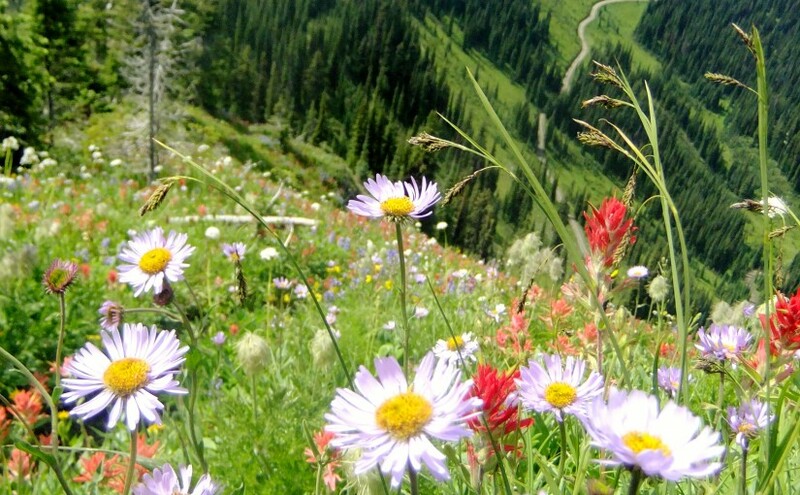 Idaho Peak offers one of the most spectacular flower shows in the Kootenays. The diversity and quantity of flowers is matched only by the diversity and quantity of visitors who come to admire the flowers and take in the 360 degree view from the lookout. This is not the place to come if you are seeking solitude. There are 2 trails to Idaho Lookout. Both meet on the ridge for the last leg of the hike up to the summit. If you would like to take the less travelled trail to the lookout, park at the Alamo parking area. The flowers along this section of the trail are every bit as showy as the ones near the ridge parking lot. Please, keep to the marked trails to avoid destroying the fragile alpine vegetation that you have come to admire. Hike is 30 min – 1 hour return trip 2 hours. Plan on 4-6 hours for the return journey from New Denver. In order to properly appreciate the history of this area a visit to the Sandon Museum ( open 10-5 ) before going up Idaho Peak is well worth an hour.